Release date: July 13th, 2010. 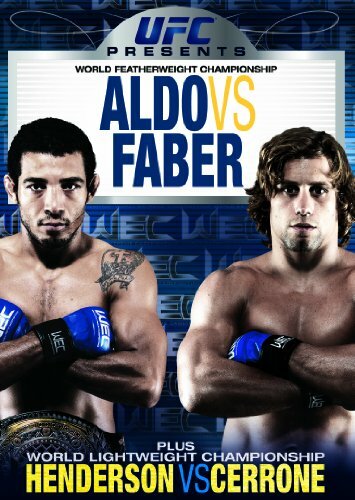 Aldo vs. Faber, despite not having the company name attached to it, was World Extreme Cagefighting’s pay-per-view debut. Leading up to it, many complained about having to pay to see a company that usually was free on cable television. Even with the full weight of WEC’s parent company Zuffa (home of the UFC) promoting it using both Versus (WEC’s television home) as well as Spike (home of the UFC), many felt the show would be very lucky to hit 100,000 buys. 100k was thought to be a very optimistic goal. When all was said and done, few doubted the right of WEC to be on ppv. The show did an estimated 200,000 buys and virtually every bout was a good one. This was a magical night. These guys were making their PPV debut and wanted to make an impact or, as Nuke LaLoosh would say, “Announce their presence with authority. They made it clear that the WEC belongs on PPV and is worth the money. Jose Aldo retained his title by dominating former champion Uriah Faber in a five round battle. Aldo peppered Faber with leg kicks throughout the fight. After one of the rounds, one of Faber’s cornermen carried him to his stool so he did not have to put weight on his swelling, badly bruised leg. Despite this, Faber never stopped fighting and was clearly looking to pull out a win even with mere seconds left. While Aldo clearly established himself as the top dog at 145, Faber cemented his legacy as a pioneer at the weight class and a true warrior with a lot of heart. Leonard Garcia and Chan Sung Jung (aka The KOREAN ZOMBIE!) left their skills at home and went to war in a crazy three round battle of cardio and heart. These dudes just brawled from start to finish, with both guys rocking the other multiple times. When all was said and done, both hugged and smiled, knowing they had just had a battle that would be talked about for years to come. If anyone is wondering why Jung is called THE KOREAN ZOMBIE, it would appear to be because he can take a howitzer blast and keep moving forward, just like something out of a George Romairo flick. 1 Tyler Toner TKO’d (Elbows) Brandon Visher at 2:36 of the first round. 3 Chad Mendes subbed (Guillotine Choke) Anthony Morrison at 2:13 of the first. 4 Brad Pickett scored a unanimous decision Demetrious Johnson. 5 Anthony Pettis landed triangle choke on Alex Karalexis 1:35 minutes into the first round. 6 Leonard Garcia played rock ’em sock ’em robots with Chan Sung Jung to earn a split decision. 7 Scott Jorgensen was awarded a unanimous decision over Antonio Banuelos. 8 Shane Roller choked (Rear-naked) out Anthony Njokuani at 3:07 of the first. 9 Manny Gamburyan knocked out (punches) Mike Thomas Brown just 2:22 into the first round. 10 Benson Henderson hit a very sweet Guillotine on Donald Cerrone at 1:57 of the first round to retain the WEC Lightweight title. 11 Jose Aldo dominated Urijah Faber for five rounds for a unanimous decision to retain the WEC Featherweight championship. I have one complaint: The lack of promotional materials. A typical UFC DVD has at least some post-fight interviews as well as post-fight footage. Outside of the main event, none of the post-fight interviews remain. And much of the promo material has already been seen on Versus and/or Spike. For many, this was an introduction to WEC and it makes sense to include footage that will help folks get to know the fighters.